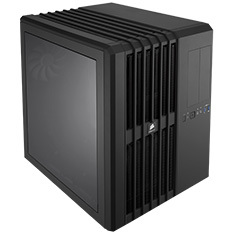 The Corsair Carbide Air 540 utilises dual chambers to deliver cooler air to your CPU, graphics cards, motherboard, and memory without your drives or power supply getting in the way. You can mount up to six 120mm or five 140mm fans, or install a 240mm or 280mm top radiator and a 240mm, 280mm, or even 360mm radiator on the front panel. Corsair's innovative cable routing system gives you more options for hiding pumps and tubing out of the way. Corsair Carbide Series PC cases have the high-end features you need, and nothing you don't. Designed to be the foundation of awesome yet approachable PCs, they combine the latest technology and ergonomic innovations with lots of room to build and expand, and amazing cooling potential.